Two years has passed since the life changing pilgrimage hike to Santiago de Compostela and Emma has finally managed to part with the never ending and destructing work environment she used to be in. When we meet her here in the fourth book in the series "Songs in the Nightfall" she has recently left Fårö, the island where she runs the bed&breakfast. To manage a B&B demanded far more work than she had expected and she decides to once again go back to Spain to hike the Compostela. Partly because she wants some peace and quiet but also because she needs to sort out her thoughts about Olle, the 20 year older man she has fallen in love with. They have spent the summer together but managed to avoid the most crucial subject of them all - children. The pilgrimage doesn't turn out the way Emma had imagined. One day she receives an unexpected phone call from home. Her mother had a stroke and is hospitalized and in bad shape. Emma reluctantly ends the hike and travels back to Sweden with her head even more filled with tangled thoughts. Is it allowed to be mad at a sick parent? Will mother die? Will she mourn or be relieved? Their relationship hasn't been easy and they have barely seen each other once over the past two years. Never the less she wonders if Olle has reached a decision and if that involves children or if they have to go separate ways. Songs in Nightfall is a book about grief, debt, forgiveness and the revision of memories. It is also about the longing for children and to be brave enough to give yourself away and be vulnerable. "A feel-good with both heart, pain and brain. Put on some coffee/ tea, light some candles and sit on your sofa and just enjoy. Because this is a top ranked novel - 5 out of 5." You can call these books Feel-good, as a reader I'm comforted and wrapped in a warm blanket sort of like a cocoon where I feel very good while ready. But they are also so much more than that. They make we look at myself from deep within, think of the choices I have made and what I want out of life... if you want to read warm and intelligent feel-good that engages you should read these books about Emma." "I have read all three of the previous books in this series and I really like all of them... In this book mixed and troublesome emotions are treated. Emma has had a complicated relationship with her mother who unfortunately drank a bit to much during Emma's childhood. When the mother then becomes really ill it is hard for Emma to know how to react and deal with her emotions. Relief is mixed with shame, sorrow with anger and she will come to learn new insights on her childhood along the way. Davidsson handles it all in a very good and respectful way in my opinion. And towards the end of the book, in the authors 'thank you' you get to know that she herself had a complicated relationship with her mother. I really like Emma. I don't shy away from her flaws because she is definitely not perfect. She is human, all characters in these books are human and that is what makes it so good. There are times when I'm nearly ready to give Emma a big lecture because I think she might me close to making a stupid choice, just like I would do with my closest friends in real life. That's how it feels, like you are reading about a good friend. "Straight forward and honest about how tricky life can be at times, and love. " "I absolutely love the book. Can’t stop thinking about it! Rating 5 out of 5. " "The angels Dance at Dawn goes directly to my year's favorites, just like the previous parts, and it will not take too long before I read the whole trilogy again. This trilogy is a must! READ IT!" "This book follows the other two previously released and becomes a total winner. It's a page-turner without equal. A film version of the three books would be wonderful, because that would lead to nothing else but a success." "The books are really absorbing, the characters are so well depicted. Easy to read and highly recommended."" "Davidsson writes incredibly straight and honest. One night I even had to take a break from reading. The words hit me right in the heart, so that I could not stop the tears from coming." It was completely, completely WONDERFUL! It is lovely with books you can't put down. I was intending to enjoy if for a week at least, but that didn’t work … Couldn’t let go of it. So god! It leaves me with such a god feeling! Thank you! Fantastic! You deliver so much feelings and warmth, and all the settings are so well depicted, it feels like I have been there. 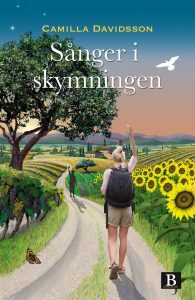 Link to a reader review in Swedish where the reader went back and read the first two novels AGAIN to write a review on the whole trilogy. "The books contains a lot of recognition, we have all been in situations like Emma is faced with. Not all of us deal with it the same way as Emma does, she hikes the 80 miles long pilgrimage to Santiago the Compostela, a life changing experience." (...) The trilogy about Emma and her struggle to make the right decisions in life is something we can all identify with. Life is not simple and sometimes we have to make hard choices, that not only affects us but the people around us. Camilla Davidsson describes this very well. And what could have been books that lectures us has instead become three darling good reads with lovely descriptions of surroundings and nice characters. (...) It's hard to let go of Emma and her life, and her life choices brings out both frustration, makes me annoyed and happy at the same time. "